els. The Gemini Launch Data System is partof a 225,000-mile global tracking and com-munications network, for which the Bell Sys-tem is the major supplier and assists in theoverall coordination, used by NASA to con-trol manned and unmanned space missions(see BTM, Spring 65, p. 64). Telephone with Headset H Busy people who must handle paper-work and phone calls at the same timewill get help with a new telephone now beingmade by Western Electric. The instrumentlooks like a standard Bell System desk set,with one important difference: it has a jackinto which an operators headset can beplugged. Use of the headset frees both handsfor typing, searching for papers or any otherbusiness that might be conducted while onthe phone. The new phone is expected to be a helpto thousands of heavy telephone users. 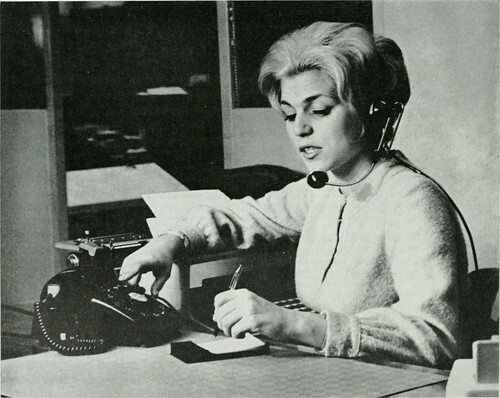 Itwill be especially useful to secretaries, orderclerks, newspaper reporters and others whoneed both hands free while phoning. It willalso be useful for those with motion handi-caps (see p. 32).